This AidCamp was held in conjunction with our partner organisation Rural Community Development Programme (RCDP) in the rural community of Lamatar in the Kathmandu valley region of Nepal. 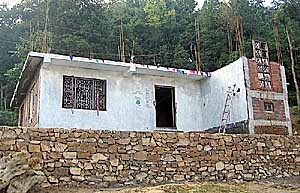 This project provided a girls' orphanage in Lamatar to complement RCDP's current orphanage in the Chitwan valley and offer young orphaned girls both a home and protection from exploitation. The major construction was completed by local labourers, paid for by the AidCamp, before the group arrived. The volunteers finished the floors and plastered and painted the building. 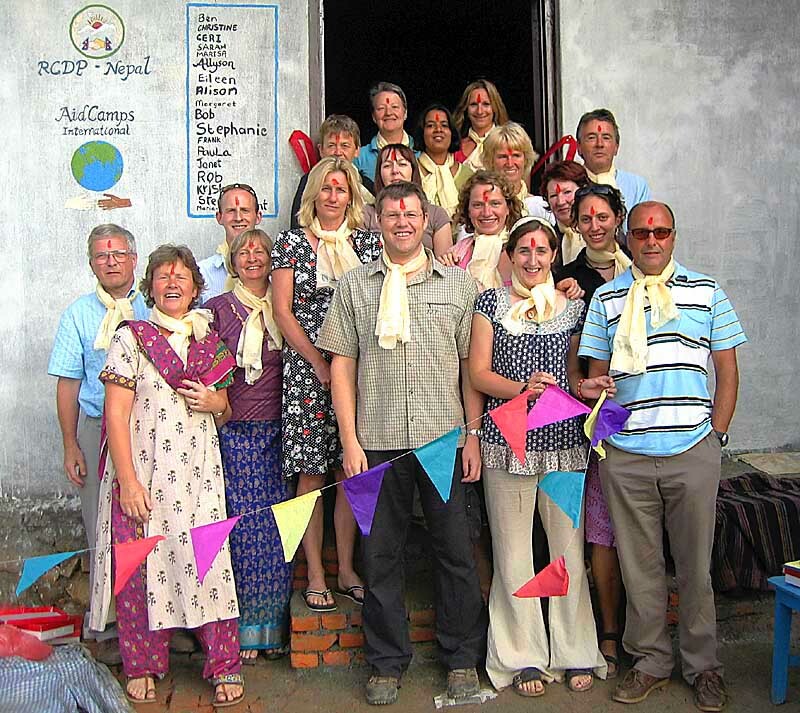 "Initially I was quite sceptical about shedding the comfort blanket which invariably went with my office job by spending 3 weeks with a group of random volunteers in a third world country I barely knew anything about. Well, I couldn't have been more wrong! From the moment I met the first batch of volunteers at the airport my inhibitions were quashed as new friendships were effortlessly formed and the good times kept on rolling. From arrival at Kathmandu airport the organisation of the entire trip was totally administered by our bubbly camp leader - Marianne. In fact the only decision I had to make was what wonderfully tasting food to order from the menu at the weekends. The labouring on the orphanage kicked off around 8.30am on the weekdays after a hearty breakfast of which included a welcoming cup of sweet black Nepalese tea or traditional English, for those who'd remembered to bring tea bags. 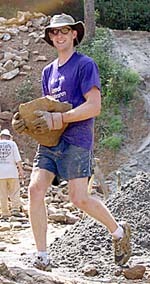 Unfortunately the first weeks labouring was hindered by the unexpected overrun of the monsoon. However the morale between the 'troops' was maintained at a peek as we all encouraged one another along. The intensity of the tasks varied from pretty hard labour intensive concrete and plaster mixing to less intensive application of the plaster. Personally I thoroughly enjoyed building up a sweat and giving everything I had into wheel barrowing endless supplies of aggregate and sand along a precariously muddy track. There were so many highlights of the trip it's impossible to mention them all. Personally, the pivotal highlight of the trip had to be the friendships we all formed with one another. Not only with the fantastic array of volunteers but also with the Nepalese people we worked so closely with during our time on camp. I would personally like to thank everyone involved in making the trip happen; from the people donating the much needed money right through to the key organisers of the trip, Marios within AidCamps and Depak within RCDP. I would also like to thank two key people who both helped the trip be that little bit more special! Firstly, the onsite representative of RCDP, Krishna, who always managed to tender to our needs and entertain us all throughout the entire 3 weeks. Secondly, I would like to thank our camp leader, Marianne, who somehow always maintained a positive upbeat attitude and was an inspirational camp leader. I absolutely can't wait to go on another group AidCamp, I just hope my powers of persuasion prove successful on my boss!" "Once again a great project and a wonderful setting." "Amazing way to experience a country and meet such a wide variety of people"
"What a great way to experience and understand a different culture." "Safe and rewarding way to experience another culture first hand." "Hard work, new friends and a beautiful location. I loved every minute." "The whole experience has been great. You meet so many different people that you just would not meet, and the team work joins you together." "An interesting experience, but not for the work-shy." 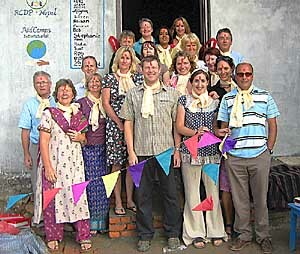 "A sheer delight and a privilege to get so many insights into Nepal and its wonderful people. Same again please!" "A truly memorable experience that I'll treasure for ever." "Enjoyed the experience a great deal and an excellent way to make new and long-lasting friends. Learnt many things from throwing cement onto the wall to understanding more about the Nepalese way of life." "I had such a fantastic time. I can't recommend AidCamps highly enough. Great people, such a wonderful cause and a fascinating cultural experience. Thank you!" "The second time was just as brilliant as the first. Once again I had experiences that will stay with me for many years." "Challenging and rewarding." "Once again a great project and a wonderful setting." "Amazing way to experience a country and meet such a wide variety of people" "What a great way to experience and understand a different culture." "Safe and rewarding way to experience another culture first hand." "Hard work, new friends and a beautiful location. I loved every minute." "The whole experience has been great. You meet so many different people that you just would not meet, and the team work joins you together." "A unique experience" "An interesting experience, but not for the work-shy." "A sheer delight and a privilege to get so many insights into Nepal and its wonderful people. Same again please!" "A truly memorable experience that I'll treasure for ever." "Enjoyed the experience a great deal and an excellent way to make new and long-lasting friends. Learnt many things from throwing cement onto the wall to understanding more about the Nepalese way of life." "I had such a fantastic time. I can't recommend AidCamps highly enough. Great people, such a wonderful cause and a fascinating cultural experience. Thank you!" "The second time was just as brilliant as the first. Once again I had experiences that will stay with me for many years."